makeup by sameera: Original Sprout - Natural Hair Care: for Babies and up! 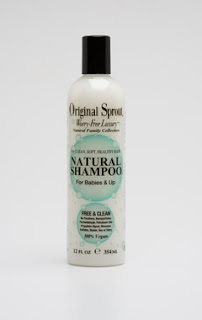 Original Sprout - Natural Hair Care: for Babies and up! Original Sprout is a personal care line out of California that prides itself on creating products that are biodegradable, 100% vegetarian (vegan), free of phytoestrogens, soy, parabens, glutens, dioxanes from sulfates, phthalates and formaldehydes. Whew! While not all of us may know what these ingredients are and why they are harmful (they do share this info on their website for those of us who'd like to know more), what's important is that Original Sprout takes the time to formulate products that are good for the earth and good for even us big babies :) by excluding these potentially carcinogenic ingredients. Original Sprout is created by Inga Tritt, mother and master stylist, who created the line for her daughter's thick hair and sensitive skin, leaving out the irritating ingredients found in other hair and bath lines. The company was kind enough to send me some of their hair products to try, and I'm happy to share my experience! This aptly named product couldn't have come at a better time for me! I had just gotten my hair dyed, and it was FRIED. I mean breaking, angry, frizzy fried. I couldn't get a brush through it to save my life, especially if I wanted to leave my hair intact. But, as soon as I misted my damp hair with a fine veil of the Miracle Detangler, it was like my hair had new life! It was soft, smooth - but not greasy smooth, just naturally smooth - and I was able to brush and style as normal. I cannot say enough about this product! It smells amazing and leaves the hair feeling clean and manageable, not heavy or weighed down. I even misted it on dry, unwashed hair and it refreshed my hair with its clean scent, and removed any crimps and frizz. With the same organic extracts as the shampoo plus strengthening Vitamin B, this is a great formula for all hair types. I also like that there are no silicones in it, so it never leaves the hair feeling heavy, greasy, or oily looking. If you're looking for a natural hair care line for big or little babies, this line is definitely worth checking out. It can be really tough to find good quality hair care that performs well and really keeps out harmful ingredients, and I found Original Sprout did the job for an affordable price.